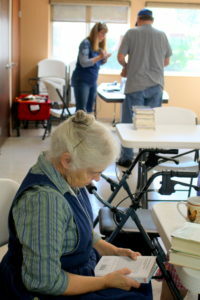 The Newton Public Library ENLITE outreach service connects Harvey County adults 60+ years of age with library items. The extensive large print collection is a key part of the project, offering a wide variety of books ranging from westerns, romance, mysteries, Christian and general fiction and animal stories to bestsellers and biographies. Books are selected for each visit by ENLITE aides, who match them with the participants’ interests. The large print collection is available for libraries in Harvey County to circulate to their readers. Those interested may contact the Newton Public Library with questions or a request to begin service.